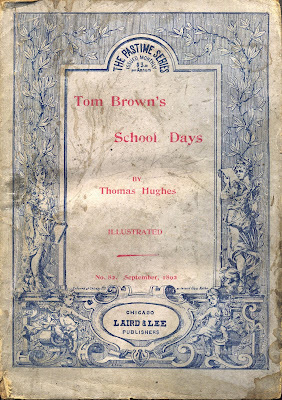 I plan to review the complete American publishing history of the two book Tom Brown series history in the future but thought I would point out a very interesting copy of one of the books that I received a couple of days ago. As you can imagine most of the editions are hardcover with a small percentage being in wraps. Here is a softcover copy published by Laird and Lee, a firm from Chicago. This house was started in 1883 by Frederick Laird and William H. Lee. Its book list had numerous series of mysteries, juvenile books, dime novels such as the Pinkerton Detective Series, dictionaries, the works of Opie Read and William Thomes adventure stories. In 1894 Laird left and Lee continued on. By 1899 the house was the third largest publisher in Chicago. What is much more interesting about Laird and Lee is where they sold many of their books. As a publishing house that was seen as a friend to labor and unions, their works were welcomed by railroad men. This contrasts to some other Chicago houses (Donohue Brothers, Geo. M. Hill and W.B. Conkey) who were actively boycotted against by unions (1901). Over the years Laird and Lee had published a number of books about the "railroad". These and others of their books were sold by news dealers and "upon all trains". Imagine a railroad employee going up and down the aisles with books -many of which were Laird and Lee books. 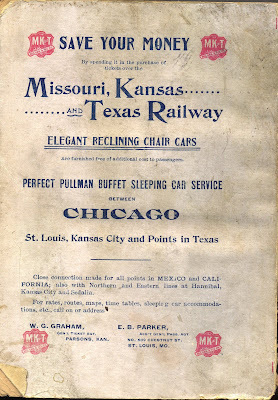 Note on the back of the book shown here there is an advertisement for the Missouri, Kansas and Texas Railway. This book published in 1892 was part of the multi authored Pastime Series. By 1896 there were 250 titles in this series.